Get notified when Seattle Seahawks tickets are available! The Seattle Seahawks compete in the NFL as a member club of the league’s NFC West division. The team was founded in 1974 and is sometimes called The Hawks by fans. 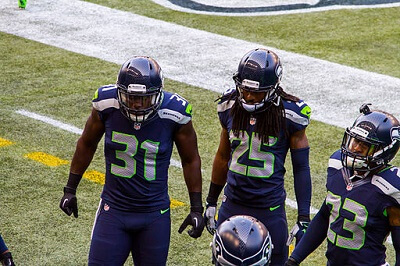 Their colors are green, grey and navy, and they won their first Super Bowl in 2013. Seahawks fans are known for being a very enthusiastic bunch, making home games truly memorable events. If you want to see the Seattle Seahawks play on their home field, get some Seattle Seahawks tickets and come to CenturyLink Stadium, which offers beautiful views of Downtown Seattle. The stadium opened in 2002 and can hold around 69,000 fans on game day.